RGP #008 - London Road Trip 2017! In late May 2017, Professor Alan, Em and Mrs. Quarter-Bin spent a few days in London, England. Meeting UK buddies Dave Walker and Stephen Lacey, we took a tour of London's top comic book shops. In this episode, Professor Alan discusses the trip, the three stores, what he purchased at each store, and the pub they all hung out at afterward. The party rolls on! 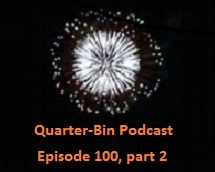 This is the Part 2 of the summer-long Quarter-Bin 100 Celebration! It's another 2-hour long monstrosity episode, in which Professor Alan talks about 19 different comics, with some of his best podcasting buddies from around the world! This episode has DCs, Marvels & Independents! Books from the 1990s! And the late 1980s! And the 1990s! Even a few from the recent 2010s! This episode has IT ALL! ﻿﻿﻿﻿Next Episode: Episode 100, part 3! Another 18 or so books, another 10 or so guests! The music in the episode is from Jeff Johnson. It is finally here! 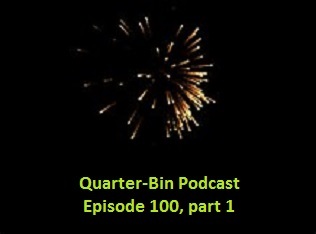 This is the START of the summer-long Quarter-Bin 100 Celebration! In this 2-hour long monstrosity episode, Professor Alan talks about 17 different comics, with some of his best buddies in podcasting! This episode has DCs, Marvels & Independents! Books from the 1990s! And the late 1980s! And the 1990s! This episode has IT ALL! ﻿﻿﻿﻿Next Episode: Episode 100, part 2! Another 18 or so books, another 12 or so guests! The music in the episode is from Timbre Cierpke. So what comics did Professor Alan read during April? How many were Rebirth books? How many were for the upcoming epic epic epic Quarter-Bin #100? And how many were from Eclipso: The Darkness Within, this year's #BestEventEver? Listen to this exciting episode #24... and find out!